Coastal Carolina University Wins First-Ever National Title In College World Series : The Two-Way "We're not the most talented team in America," Coastal Carolina's coach Gary Gilmore said after the game. "We're just the national champion. That's all I know." Pitcher Alex Cunningham and catcher David Parrett of the Coastal Carolina Chanticleers embrace after striking out the final batter to beat the Arizona Wildcats 4-3 to win the National Championship at the College World Series at TD Ameritrade Park in Omaha, Nebraska. 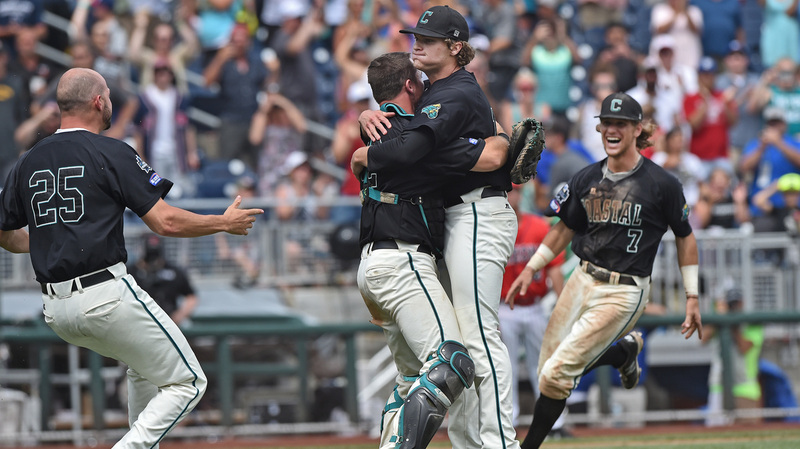 Instead of the Arizona Wildcats claiming their second championship in five years, the Coastal Carolina Chanticleers broke through to win their school's first national title, holding on for a 4-3 win in the decisive Game 3 of the 2016 College World Series. A national championship is a big deal for any college; this one is huge for Coastal Carolina, a school in Conway, S.C., that reported total enrollment of 10,263 students (graduate and undergraduate) when classes started last fall. By contrast, Arizona reported having 43,088 students. It's the first time since 1956 that a team has won the College World Series in its first appearance, according to the AP, which adds that Minnesota was the last team to record the feat. "We're not the most talented team in America," Coastal Carolina's coach Gary Gilmore said as his players hugged and celebrated after the game. "We're just the national champion. That's all I know. That's all that matters." The only player from Coastal Carolina who's currently on an active roster in Major League Baseball is the Tampa Bay Rays' Taylor Motter — who was watching today's game during a stretching session on the field at Tropicana Field. As the final out was shown on the big screen, Motter pulled off his Rays jersey to reveal the teal of a Chanticleers shirt underneath. The championship was in doubt until the final at-bat, which started at midday after bad weather forced a postponement Wednesday night. Trailing 4-2 in the ninth inning, Arizona used a sacrifice fly to score a run and a double from Ryan Aguilar to put runners on third and second base, threatening to tie or win the game outright. But on a 2-2 count, the game ended on a swinging strikeout. Coastal Carolina seized the title by winning two games in a row; the Chanticleers had lost the series opener Monday, 3-0. On Tuesday, a tense Game 2 ended in a 5-4 victory that was built on Gilmore's unconventional decision to have Coastal Carolina's closer, Mike Morrison, start the game. Morrison struck out 10 batters over 6-2/3 innings to keep his team's season alive. Coastal pitcher Andrew Beckwith – who went from performing a bullpen role earlier this season to dominating as a starter during the playoffs — was named the most outstanding player of the series. Both Beckwith and Wildcats starter Bobby Dalbec lived up to their elite reputations Thursday, keeping the game scoreless through five innings. But neither pitcher would survive the sixth, when nearly all the game's runs were scored. After Arizona committed two errors that led to runs, Coastal's G.K. Young crushed a 415-foot home run to put his team out of reach. Arizona answered with two runs in the bottom of the inning to chase Beckwith. After the game, many Coastal Carolina players dedicated the win to Gilmore, who's coached at their school for 21 years. Gilmore said the title should put to rest any doubts about his program. "They just thought we played in a small conference and couldn't get this done," an emotional Gilmore said after the game. The players, he said, "wanted to prove everyone wrong." The title game brought Gilmore the 1,100th win of his career; it also capped a month in which he was named the National Collegiate Baseball Writers Association National Coach of the Year.